NOTE: Visio 2010 is required for this project. Please ensure you can run Visio 2010 via Citrix or by having it installed on your computer. # Run Visio 2010 either via Citrix or on your workstation. # Click on the Software and Database Template group in the main window. 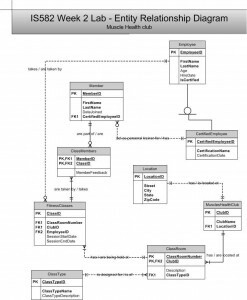 # Double-click on the Database Model Diagram Template to open a new file. # Save the file with a name containing Lab2_, your first initial, and your last name as the file name (e.g., Lab2_JSmith.accdb). You will need to click the computer icon in the Save As window to see the different drives. Be sure to save the file to a local drive so it will be on your workstation. # Drag the entity icon onto the drawing area in Visio. # In the Database Properties window, add a physical name to identify it. # Select an entity in the drawing area of Visio. # In the Database Properties window, select the Columns category. # Use the table to add your attributes to the selected entities. # Select one of the attributes to be the primary key (PK). # On the Database tab, in the Manage group, click Display Options. # In the Database Document Option dialog, select the Relationship tab. # Select the Crow’s Feet check box, and then click OK.
# Drag the relationship icon onto a blank part of the drawing area. # Connect the two ends to each of the two entities in the relationship. The parent entity must have a PK defined. The entity will be outlined in bold red lines when it connects to one end of the relationship. # Select a relationship line in the drawing area that is connecting two entities. # In the Database Properties window, select the miscellaneous category. # Select the cardinality for the selected relationship. Each query is worth 10 points. Points for each query will be awarded according to the following rubrics. # 20 Points: Visio drawing: E-R model is provided as a Visio diagram. # 20 Points: Attributes: There are more than two attributes per entity; in most cases there should be several. # 20 Points: Relationships: A minimum of three relationships is present. # 20 Points: Cardinality is specified on each relationship with crow’s foot notation. Just dropped in here to get this lab and add some postive remarks. Got full score in the previous lab. You r a GEM!!!!! Thanks. Thanks. I appreciate that and look forward to assist you again whenever needed. Do yo happen to have any preparation stuff for quizzes? That would be very helpful. Yes, kindly send me a message on support@iqrajavaid.com. Excellent job Bro, 100%. Thanks!